Order the book at Cambridge University Press. Costs about 40 euro (paperback). Errata, Comments, Summary of concepts, Support. 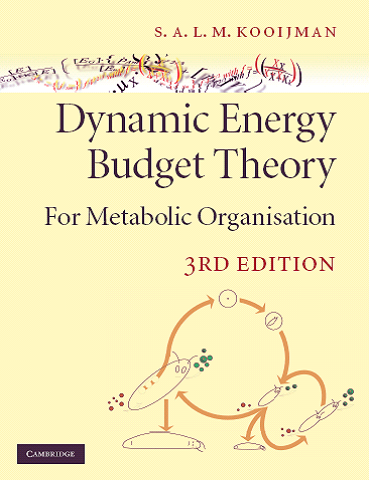 Dynamic Energy Budget (DEB) theory is a formal theory for the uptake and use of substrates (food, nutrients, light) by organisms and their use for maintenance, growth, maturation and propagation; it applies to all organisms (microorganisms, animals, plants). The primary focus is at individual level, from a life cycle perspective, with many implications for sub- and supra-individual levels. The theory is based on sound chemical and physical principles, and axiomatic in setup to facilitate testing against data. It includes effects of temperature and chemical compounds; aging is discussed as an effect of reactive oxygen species, with tight links to energetics. The theory also includes rules for the co-variation of parameter values, better known as body size scaling and quantitative structure activity relationships. Many well-known empirical models turn out to be special cases of DEB theory and provide empirical support. Many additional applications are illustrated using a wide variety of data and species. After 30 years of research on DEB theory, this third edition presents a fresh update; since the second edition in 2000 some 140 papers appeared in journals with a strong focus on DEB theory. The biannual DEB tele-courses provided input to improve the presentation. A lot of supporting material for this book is meanwhile developed and freely available, such as software package DEBtool; one of its toolboxes contains code that generates the figures of this book: setting of data, model specification, parameter estimation, plotting. By replacing data by that of your own, you have a convenient tool to apply the theory. This edition includes a new chapter on evolutionary aspects, discusses methods to quantfy entropy for living individuals, isotope dynamics, a mechanism behind reserve dynamics, toxicity of complex mixtures of compounds, an updated aging module now also applies to demand systems, new methods for parameter estimation, adaptation of substrate uptake, the use of otoliths for reconstruction of food level trajectories, the differentiated growth of body parts (such as tumours and organs) linked to their function, and many more topics are new to this edition. Individuals as dynamic systems; homeostasis is key to life; effects of temperature on rates. Assimilation; reserve dynamics follows from homeostasis; the kappa-rule for allocation to soma; dissipation excludes overheads of assimilation and growth; growth of structure; reproduction exports reserve; parameter estimation I. Body size and composition; classes of compounds in organisms; macrochemical reaction equations; isotope kinetics; enzyme kinetics revisited; classification of types of processing and of compounds; number of SUs affects transformation rates; inhibition and co-metabolism; supply versus demand kinetics; metabolic modes. Changing feeding conditions; changing shapes; conservation of elements; carbon, water, dioxygen and nitrogen balance; conservation of energy; thermodynamic aspects; micro-chemical reaction equations; isotope dynamics; product formation; parameter estimation II; trajectory reconstruction. Extensions to more than one substrate, reserve and structural mass; photosynthesis and plant development; simultaneous nutrient limitation; calcification. Ageing; uptake kinetics; energetics affects kinetics; toxicants affect energetics. Details of specific processes, such as networking via handshaking of SUs; feeding; digestion; cell wall synthesis; organelle-cytosol interactions; pupae; changing parameter values; adaptation; mother-foetus interactions. Intra- and inter-specific parameter variations; QSARs; interactions between QSARs and body size scaling relationships. Trophic interactions between organisms; population dynamics; food chains and webs; canonical communities. Before the first cells; early substrates and taxa; evolution of individuals as dynamic systems; merging of individuals in steps; multicellularity and body size; from supply to demand systems; life builds on life. Methodological aspects of energetics; a weird world at small scale; DEB models have many empirical models as special cases; comparison with other approaches.